Pakistan batsman Ahmed Shehzad faces disciplinary action for religious comments he made to Sri Lanka's Tillakaratne Dilshan after Saturday's one-day international in Dambulla. Shehzad was shown in footage, telling Dilshan: "If you are a non-Muslim and you turn Muslim, no matter whatever you do in your life, straight to heaven." Pakistan internationals are banned from making religious or political comments. Pakistan Cricket Board chairman Shaharyar Khan said: "There is a clause which states clearly players should not indulge in talk of religious or political nature in public while representing Pakistan. "Shehzad has violated this clause on evidence of what we have seen in the video footage of the incident." Khan added that the Sri Lankan board had not complained about the incident. 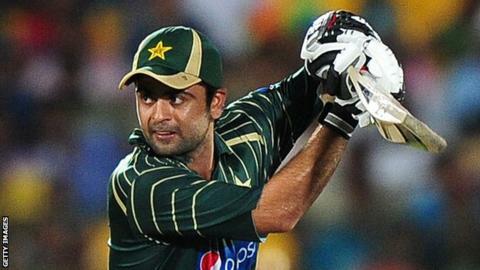 Shehzad scored 10 runs in Saturday's match, which Sri Lanka won by seven wickets to clinch the three-match series. Shehzad, who has played five Tests and 48 ODIs, claims the comments were just banter with Dilshan and that he meant nothing by it. The 22-year-old has had his share of disciplinary problems since making his debut for Pakistan's Under-19s side. He was reported as a junior player for curfew violations and has had counselling sessions organised by the board. And last December he was fined half his match fee for pushing Dilshan during a one-day international between Pakistan and Sri Lanka in Abu Dhabi.